Multi-screen Display Wall installations can be challenging to design, build, configure and implement. Highly creative display projects often require multiple monitors arranged in unconventional formations with a myriad of bezel sizes, gaps and monitor positions. Project designers, installers and integrators require simple yet effect video wall creation tools in order to manage the project from start to finish. Datapath's Wall Designer is the perfect solution to creating and managing an entire video wall project. 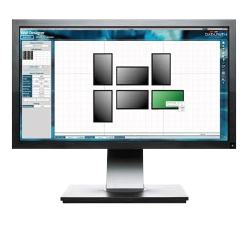 Created to work seamlessly with Datapath's x4 Multi-Display Controller, Wall Designer allows project builders to select their monitors by manufacturer/model and arrange & orientate them onto a canvas. Select the required source and resolution and finally add a range of x4s ready for auto-configuration. Datapath's Wall Designer software includes a community driven monitor database. A range of monitors from popular manufacturers are included at launch and the list increase over time as users add their own monitors and submit back to Datapath. Information such as screen dimensions (in pixels & millimeters), bezel sizes and refresh rates are all included. Datapath will provide regular updates and users can add their own monitor information and submit back to the master database for inclusion in the next update. Select the monitor required or add a new one. Select single or multiple monitors via the mini canvas and then add them to the project. Mix and match monitors from different manufacturers to suit the project. Align and rotate each monitor to place it perfectly onto the main canvas. Select the monitor required or add a new one from the menu in the top left of the screen. Select the monitor required or add a new one from the menu in the top left of the screen. Select single or multiple monitors via the mini canvas and then add them to the project. Manipulate each monitor to place it perfectly onto the main canvas including the ability to rotate and align the monitors. Add content into your Wall Designer project and place it across the virtual canvas filling the monitors with rich content. Adjust the input resolution to ensure the project matches the real content. Automatically arrange the capture regions or adjust each region to suit. Print out the design schematics which include useful measurements to aid in project build and installation. Figures are available in millimeters or inches and monitor orientations are provided. Automatically add x4s to your project and assign each output to a monitor. Re-draw output/monitor assignments to suit the project's needs and help installation builders. Wall Designer will advise if the project exceeds video bandwidth limits and will display a Datapath dL8 if one is required. Connect a number of x4s to your PC or Laptop and Wall Designer will allow you to assign the x4s to monitors and program them. Full monitor EDID management available for timing adjustments. Wall Designer is available for Windows Vista (SP2), Windows 7 (SP1), Windows 8, or Windows 8.1. Wall Designer requires Internet Explorer 10 or better.